Members of Thespian Troupe 5480 from Gloucester County Institute of Technology wear medals for their superior performance of a group musical during the Individual Events program at the New Jersey chapter Thespian event. The group went on to perform in the IE showcase and were among the first Thespian recipients of the New Jersey Governor's Awards. Photo courtesy of New Jersey Thespians. Begun in 1980, the New Jersey Governor’s Awards in Arts Education annually recognizes New Jersey arts educators and students who have done exemplary work in creative writing, speech, dance, music, theatre, and the visual arts. Awardees attend a ceremony in May, where they receive a medal and the opportunity to share some of their work. Little knew New Jersey Thespians who deserved the Governor’s Awards honor, but for years, attempts to bring the awards to Thespians led ultimately to dead ends. Early this year, her research and networking paid off when a representative from the Governor’s Awards attended the New Jersey chapter’s Thespian festival. After a frantic 48 hours to complete the necessary paperwork, New Jersey Thespians were able to offer their first New Jersey Governor’s Awards in six categories, including contrasting monologue, solo musical, duet musical, group musical, chapter select, and film. 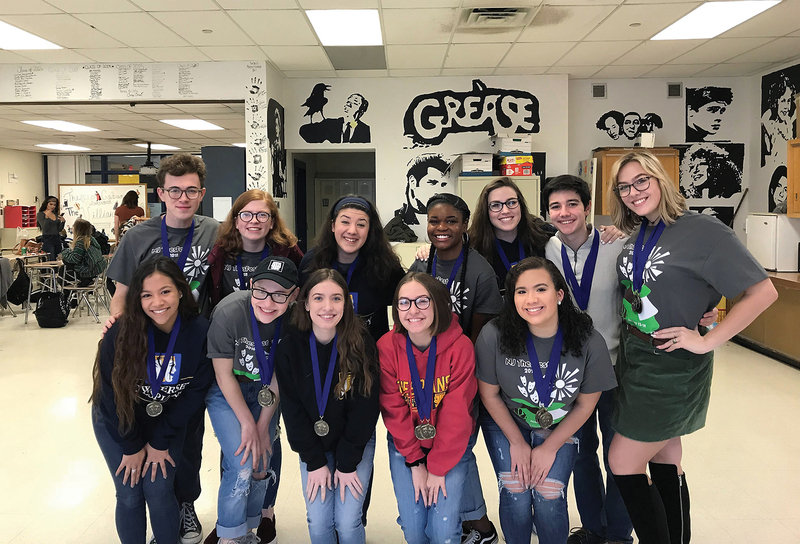 New Jersey Thespians who delivered superior performances at the chapter’s festival have been invited to celebrate their achievement at the May ceremony in Trenton. Looking to build on this success, Little is now lobbying the Governor’s Awards organization to allow New Jersey Thespians to give 12 awards, so that students in technical theatre categories can also take home a high honor in the state. Little stressed that being a Governor’s Awards recipient boosts a student’s college application, especially for those applying to colleges in New Jersey, where the Governor’s Awards have a high profile. Alyssa Sileo, a senior at Gloucester County Institute for Technology School of Performing Arts and a member of Thespian Troupe 5480, was one of the first New Jersey Thespians to receive a Governor’s Award. She and her fellow Thespians performed a group musical theatre number from Urinetown and received a superior rating in the Individual Events program at the New Jersey festival. Her group went on to participate in the Individual Events Showcase and ultimately received Governor’s Awards for their work. During their first performance in front of festival judges, though, Sileo said the recorded musical track cut out. Without missing a beat, the group stayed in tune and in time, making their way through a difficult dance break and tricky harmonies. For her, receiving a Governor’s Award is a treasured achievement that she’ll always share with her friends and classmates. Little is adamant that without her board, her chapter’s recent success would not have been possible. Without them, she wouldn’t have had access to the right people and wouldn’t have been able to turn around the Governor’s Awards paperwork in time. Many of her board members are Thespian alums who not that long ago were in high school themselves.